Interviewing is a crucial skill for journalists but the list of professions that rely on the interview to conduct business is long. From doctors and police to clergy and the gal or guy at the drive-through window, just about every human interaction is a form of interview. Interviewing: The Oregon Method collects analysis and instruction from three-dozen expert interview practitioners, scholars and teachers. Its chapters take focused looks at interview ethics, the sanctity of quotes, sourcing via social media, studies of interviewing in the virtual world, negotiating identity, and building rapport. The art of interviewing has been taught at the University of Oregon School of Journalism and Communication for generations. This book binds those years of experience into a collection of vibrant essays designed to train novices and invigorate old hands. 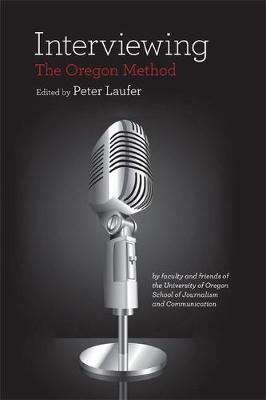 Interviewing is edited by University of Oregon's James Wallace Chair Professor of Journalism Peter Laufer, who lectures his students, "The interview is intimate, immediate, and often an entree toward the soul. Conducting interviews can be both great fun and an art form." Interviewing is a primer of the digital age yet one that embraces age-old lessons, lessons that make clear the crucial importance of successful interviewing techniques for productive civic engagement. In conjunction with the Center for Innovation and Civic Engagement at the University of Oregon, USA, contributors include Pulitzer-prize winning reporter and UO professor Alex Tizon, retired Seattle Times executive editor and UO alumnus Mike Fancher, and the longtime dean of the UO School of Journalism and Communication Tim Gleason. Distributed for the University of Oregon School of Journalism and Communication Center for Innovation and Civic Engagement.